Get your custom USB drives from a company that has more than 23 years of experience in the content storage business. Need a last minute USB order? Don't worry, we can handle it. We offer turn times as low as 24 hours. Need an entirely custom-made USB in a specific shape and colors? Our experts can help you convert your ideas to reality. 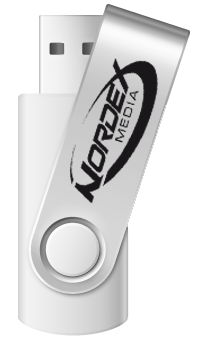 At Nordex, we offer a large selection of premium USB packaging options including plastic, tin, paper, leather, and wooden boxes. Custom USBs are available in capacities up to 128 GigaBytes. A branded USB can promote your company and spread your corporate identity everywhere.